4.5 stars. 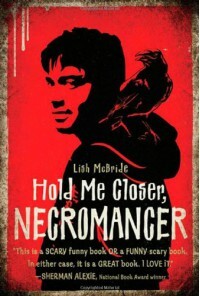 Being that Hold Me Closer, Necromancer is about a young man practicing the dark art of Necromancy, you'd think the book would be dark. Can I answer yes and no to this one? I'd almost call it a dark comedy of sorts. For a book about such an offbeat and bizarre subject, dare I say this was an enjoyably easy read? Because it really was. Something that I liked about this book was that it felt very gender neutral and could appeal to a multitude of ages. Even though the book is a YA, the main character is out of high school and absorbed in the working world, so it felt like an adult read without being heavy or overly descriptive like some adult reads are.If you've read Holly Black's White Cat and enjoyed it, then I'm pretty sure you'll vibe on HMCN. Here are some comparisons : Both stories have a male lead character. Both involve a taboo type of magic, and the characters are surrounded by people who are set out to use their abilities. Neither book is romance heavy, but there is a love interest. Both books have a decent amount of snarky humor. Both books were win. HMCN felt a touch older than WC since the main character was in high school for WC, but I think fans of one book would like the other, regardless.